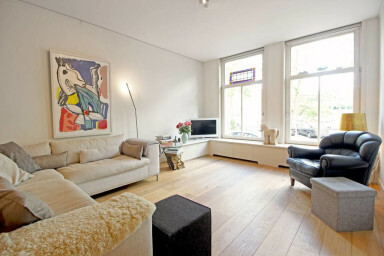 The apartment is situated along the Singelgracht and is divided in two floors. The ground floor is the so called ‘beletage' and there's half a basement, which is the 'souterrain'. A great thing about this, is that it remains cool during the hot summer days! At the 'beletage' you find the entrance, hall and a toilet, together with an atmospheric living with open kitchen and access to the terrace and garden. A good spot to enjoy the afternoon sun. Downstairs you also find a bathroom (2 washbasins, bathtub and shower) and a separate toilet and laundry. A great feature about this apartment is that it has a city garden with a comfortabel terrace. You can just sit down in the sun and enjoy some nice drinks all day long. It's a great apartment at a really nice neighborhood. You'll really feel like a local while staying at this apartment. You have access to the whole house with kitchen, bedroom, bathroom and living room. You do not have to share this apartment with others. Make yourself comfortable as if it is your own apartment! Iamb&b will let you in, hand you the keys and show you around in the house and if you like in Amsterdam. After that you can always call if you need any assistance. This wonderful residence is situated close to trendy bars and restaurants in the Jordaan area, the main shopping area (Negen Straatjes, Kalverstraat and PC Hooftstraat). A very relaxing and spacious apartment right in the booming city centre. The more sportive types can easily do pick a workout at the Marnixbad (pool and gym). And for a refreshing walk you have Westerpark and Vondelpark around the corner. Want to relax like a real local does? Fill up the cool box, rent a 'sloep' (longboat) and enjoy the canals by cruising around. At 100 meters you find a company that rents 'sloepen. Just around the corner you find all kinds of shops for your daily groceries: supermarkets, fresh bakery, butcher, etc. On Saturday the close by Lindengracht market and biological Noordermarkt are worth a visit. The location of the house is very central and close to all kinds of public transport that while bring you alle around the city. Stops: Rozengracht, Bloemgracht, Hugo de Grootplein. Check in after 21:00 is possible, but it costs an additional of 20 euro. After 00:00, we ask an additional 50 euro. For other check-in and check-out times please contact me. Are you interested in a late check out? Please check the availability 2 days before your check out date. If the apartment is available we offer a late check at 14:00 for an additional charge of 20 euro. You will feel right at home! This property was perfect four our family of 4. We stayed in three countries on our vacation, and this was the first place where my wife and I had a separate place to sleep from the children. It was also the best nights sleep we had. The host was friendly and accommodating. The location is very good as well. If we ever stay in the city of Amsterdam again, I would definitely consider using this property again.